The internet is a fantastic tool and is a brilliant resource to help aid our learning. However it is crucial that our children know how to access and use the internet appropriately and ‘How to Stay Safe’. Staying safe on the internet and using new technologies is referred to as ‘E-Safety’. This includes the use of mobile phones, iPads, iPhones and game consoles. If you are concerned about any of the above you can speak to our Safeguarding Team. Alternatively you can speak to your Class Teacher. Please click on the links below for some helpful guides about parental controls on games consoles. 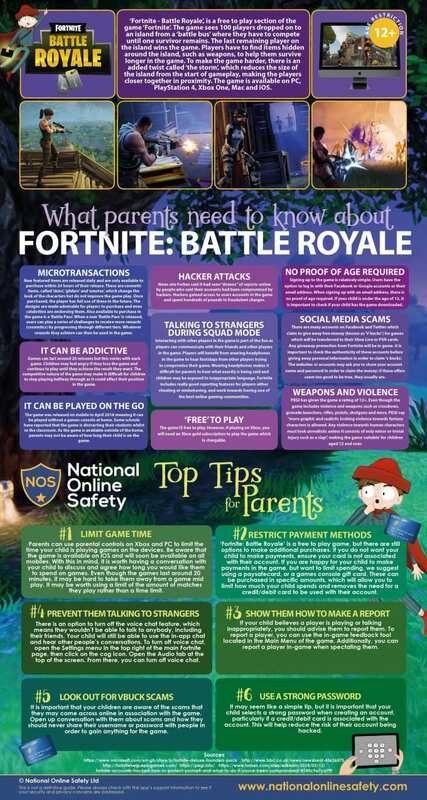 Parents Guide for Fortnite. Click on the picture to open the attachment.